Carpal Tunnel Syndrome (CTS) is characterized by pain in the wrist and hand, especially when the thumb is bent toward the palm. Sensations include a burning, tingling, or aching that may spread to the forearm and shoulder. Pain may be persistent or intermittent, and is frequently experienced at night. When the condition is severe, the muscles of the hand stop functioning, and may waste away from lack of use. 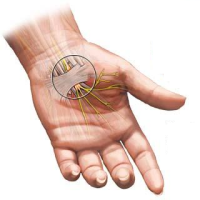 Carpal tunnel syndrome stems from pressure to the middle nerve in the channel in the wrist that houses nerves and tendons. It can occur after many years of work involving repetitive use of the hands, as on a computer keyboard, or it can occur more suddenly, after a blow or swelling. CTS can also be brought on by rheumatoid arthritis, and sometimes the fluid retention of pregnancy is a contributory factor. The best way to combat carpal tunnel syndrome is preventative measures. Four factors have been delineated that can contribute to developing CTS in the workplace: excessive force, static posture, repetitive activity, and awkward positions. Here are some ways to counteract the percentage of getting CTS. One thing is to take breaks from repetitive tasks. It would be a good idea to vary tasks. Take an opportunity to meet with a client or go on the phone to move away from the computer. Rearrange work area and furniture to eye level to minimize the sharp angles that joints must make. These sharp angles have a tendency of pinching and irritating internal tissue. Make sure to take a have a comfortable position at work. If hands are angled up from wrists when typing, raise position or lower key surface. If shoulders are hunched down because table is too low, make the appropriate adjustments. If phone headset is tight pinched between ear and shoulder, use a headset. If head is pushed forward to look at monitor, move monitor closer and lower it. Take frequent breaks during the workday to stretch and move around as much as possible. Sitting in one position holds the muscle in one place making it tight and less supple. Use less force in work. For example, try holding the pencil less tightly. Don’t squeeze mouse and pound keys. Work with minimal pressure to accomplish same thing. Invest in ergonomics to lessen the pressure. A doctor diagnoses carpal tunnel syndrome by tapping the wrist. Any kind of pain or tingling that happens because of the tapping is a positive sign of CTS. The doctor may also bend the wrist forward to see if there is any weakness, tingling, or numbness. Wrist X-rays are used to rule out arthritis. Nerve tests can measure the impulse of nerve transmission, can confirm the diagnosis, and evaluate the extent of any damage by assessing the function. When worn at night, wrist braces will take the pressure off the median nerve by keeping the wrist straight. This is applied several times a day and can help with the range of motion and temporarily relieve wrist pain. Non-steroidal anti-inflammatory agents can provide temporary relief of pain and swelling. If this is not enough, the next option is oral steroids or injection of corticosteroid medication into the carpal tunnel space. For half the people with CTS, and for people that find no relief in steroid injections, the only treatment left is the surgical removal of the ligament pressing against the median nerve. Ultrasound treatments have been found to be effective. Yoga has lead to significant improvement. Willow bark is an original source of aspirin and contains salicylates which reduce both pain and inflammation. Take one to two teaspoons of dried, powdered willow bark or five teaspoons of fresh bark for ten minutes, then strain out plant material. It can be made to a lemonade mixture to seal the bitter taste. Drink two to three cups a day. If allergic to aspirin, do not take willow. Camomile tea is a great way to calm nerves, especially with the active compounds (bisabolol, chalmazulene, and cyclic ethers) which are potent anti-inflammatory action. Pineapple has a protein dissolving enzyme bromerlain which has well documented effects on many inflammatory conditions. Bromelain can reduce pain, inflammation, and swelling. Naturopath doctors suggest taking 250 to 1,500 milligrams of pure bromelain every day in between meals to treat CTS and other inflammatory conditions. Bromelain is also available individually in health food stores. Red pepper is a great for CTS as it contains six pain relieving compounds and seven which are anti-inflammatory. Herb can treat CTS several ways. Several teaspoons of it can be added to lotion and applied to wrists. A capsacin lotion can be made by adding five to ten red chili peppers in two pints of rubbing alcohol for two days. Rub on small area to see how it feels, if causes irritation, discontinue use. 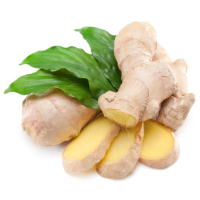 This herb contains curcumin, which is a potent anti-inflammatory chemical. Natruropathic doctors suggesting taking 250 to 500 milligrams of pure curcumin a day between meals. Comfey has active compounds such as allatonin and rosmariinic acid can be applied topically to relieve pain, inflammation, and swelling. It is important not to ingest comfey as it may cause liver damage, but there are no reported risks when applying it topically to the skin. Six anti-inflammatory compounds have been identified in sage. Three pain relieving compounds, seven anti-inflammatory compounds, and four compounds that combat swelling make cumin a great herbal CTS remedy. Naturopathic doctors suggest 40- 80 milligrams of B6 twice a day to treat CTS. In a study with CTS patients as subjects, two-thirds of those using the suggested amount reported improvement.